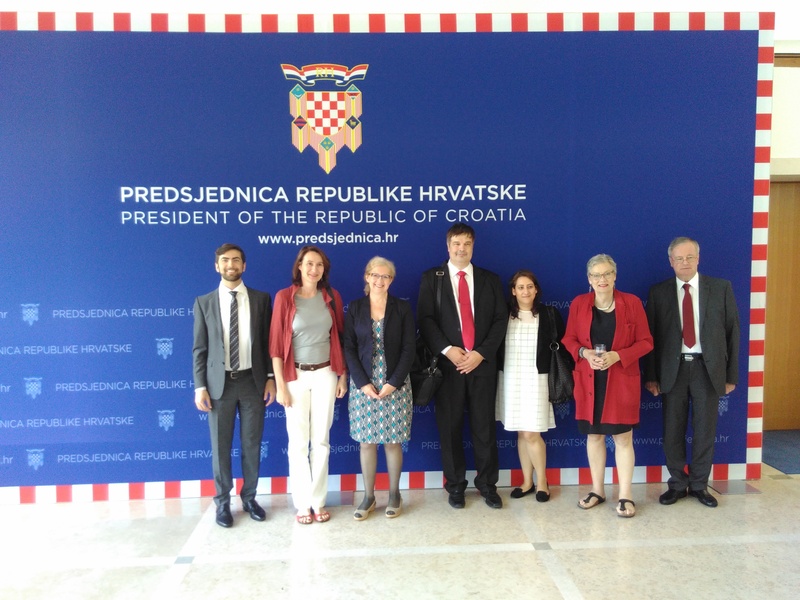 Members of an international media freedom delegation at the Office of the President of the Republic of Croatia on June 21, 2016. Photo: ECPMF. Croatian President Kolinda Grabar-Kitarović told an international media freedom delegation today that she supports efforts to protect the independence of national public broadcaster HRT and to repeal her country’s controversial ‘shaming’ law. While Croatian political parties have traditionally sought to control HRT, alarmingly rapid moves by the outgoing Croatian Democratic Union (HDZ)-led government to replace key positions at the broadcaster have raised international concern. Some observers have warned that the moves represent an attempt to promote a nationalist – and in some cases even historical revisionist – editorial line. The president, in response to concerns raised by the delegation, assured that Croatia would not follow the path of fellow EU states Poland and Hungary, where right-leaning governments have sought to tighten control of the respective public broadcasters through a combination of legal restructuring and mass personnel changes. Croatia’s law on “shaming” – a vague, defamation-like offence punishable with a criminal fine – has been the subject of intense criticism since taking effect in January 2013. In 2014, prominent journalist Slavica Lukić was convicted of ‘shaming’ over her investigative reporting into corruption at a medical clinic that received public funds. “The shaming law needs to be abolished,” Grabar-Kitarović told the delegation. While noting her office’s efforts to maintain an open relationship with the media, Grabar-Kitarović, a former senior NATO official, underscored the need to further improve media ethics and responsibility in Croatia. She pointed in particular to what she described as a lack of media sensitivity with regard to gender and certain minority issues. She also urged journalists to conduct proper fact-checking and engage in balanced reporting. However, like Grabar-Kitarović, Hasanbegović accepted that there was a need to find what he called the “least damaging model” to promote independence in Croatia’s public-service broadcaster. He insisted that because of HRT’s public nature and its cultural impact, the government had a right to have a say in the channel. 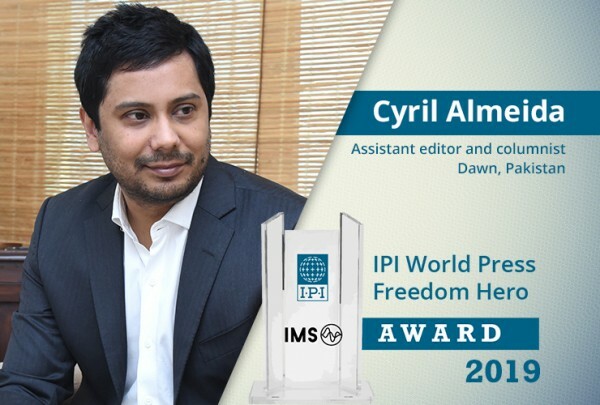 “We need to find a balance between government influence and media autonomy,” he said. Hasanbegović defended the government’s actions with regard to HRT by noting that all changes were taken within the relevant legal framework, which was approved by the previous Social Democratic (SDP) government. In response, delegates noted that the current government could, rather than repeat history, take concrete steps to end the cycle of politicisation. The delegation arrived in Croatia shortly after the country’s Parliament dissolved itself, ending a troubled five-month-old coalition between the right-leaning HDZ and the centrist Most party. New elections are scheduled to be held in September. 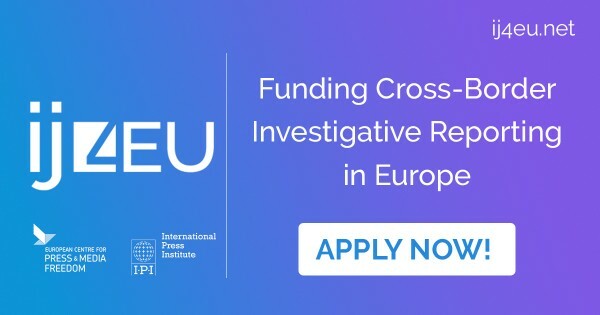 In addition to SEEMO, the delegation also includes representatives of the European Broadcasting Union (EBU), the European Federation of Journalists (EFJ), the European Centre for Press and Media Freedom (ECPMF), the International Press Institute (IPI), and Reporters Without Borders Austria (RSF).